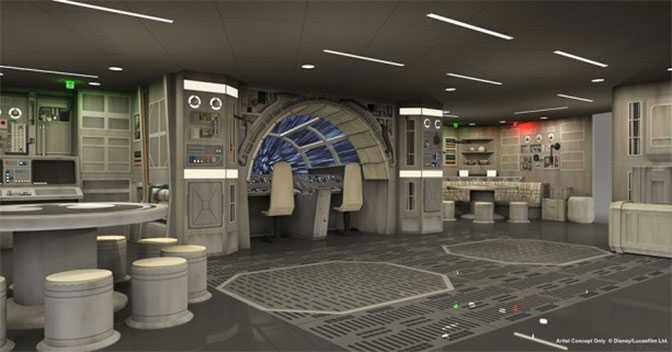 A Target-exclusive Blu-ray version of Solo: A Star Wars Story has provided us with a few details of the upcoming Millenium Falcon ride coming to Galaxy’s Edge in Disneyland and Disney’s Hollywood Studios. The Millenium Falcon ride will offer 7 pods of 6 guests each for a total of 42 riders per show. Each pod will be capable of rotating 360 degrees with action happening all around your pod. The mission of the ride is to retrieve as much loot as possible during a mission directed by Hondo Ohnaka. Hondo is a pirate from Clone Wars and Star Wars Rebels. This sounds like a great experience with the ability to actually interact with your environment, rather than sitting placidly on a vehicle like Star Tours. What are your thoughts? Previous PostMagic Kingdom Early Morning Magic expanding to offer new ridesNext PostGet your FREE Disney Cruise Line quote for New Orleans or Hawaii iteneraries! any idea on dates yet? Will it open before December 2019? Sounds amazing for the best scenario. If your flight crew is not able to fulfill their roles ( kids, language barrier, etc), you could wait a few hours for ride that could be pretty disappointing, especially if you are shot down prematurely. Hopefully they compensate for that. I would assume that they’ll make it awesome no matter the outcome :) I think they’ll plan for all eventualities and make it an enjoyable experience. Maybe even more fun is someone screws up! I see myself getting nauseated by it :( I can barely ride Mission Space (green side at that), can’t handle anything 3D. Guess I really need to try out the SeaBands or something b/c Bonine didn’t help last trip. Didn’t they originally want or have mission space actually interactive, but found / thought that guests wouldn’t do their job properly and thus the ride wouldn’t work out well ? Only thing I can see as a problem with this is that one role will be much more popular than another, ie: gunner vs engineer – as a result people, esp kids, will get really disappointed if they don’t get the role they want. Could be a bit of a nightmare for parents and CMs alike. Only for the parents who have kids that think throwing a tantrum will get them what they want. Disney is quite used to the spoiled attitude of guests, they’ll tamp down those attitudes before boarding. This reminds of the fights me and my brother would have over getting the steering wheel on Mr Toads Wild Ride and that wheel did absolutely nothing. I hope they can accommodate larger guests unlike the pandora ride! Cannot wait to this opens! Kenny, any idea on height requirements or are we WAY too early in the process for that? Just wondering how intense this ride will be? Just a wild guess, but I’d say 40″ to 44″ is likely. Wow! This actually sounds amazing. Course anything Star Wars I’m on board with. I do can’t wait! Sounds like a deluxe version of Mission Space. Except it’s totally different :) Only thing that Mission: Space does is beep when you push the right button. Yup, and they’d better be sure to make those buttons, knobs, and dials super durable or things are going to break down fast. And this time Disney doesn’t have the luxury of years of testing with actual guests like they did with Toy Story Mania, and being able to test versions of the pull string mechanism on Pirates of the Caribbean Battle for Buccaneer Gold at DisneyQuest.